In a time of declining resources in institutions of higher education, we grapple with how priorities are to be set for the limited resources available. Most vulnerable are those students labeled underprepared by colleges and universities. Should we argue that the limited resources available ought to be used to support these students through their undergraduate years? And, if we decide that we want to do that, what evidence of their potential for success can we provide that will justify the use of these resources? 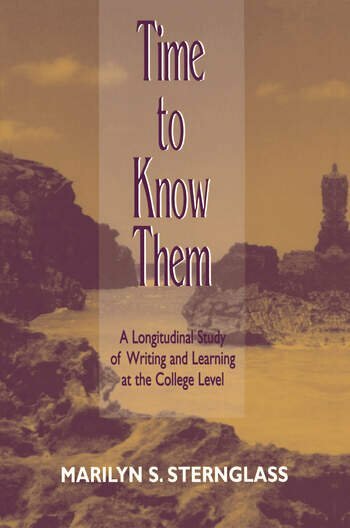 Through longitudinal research that follows students who have been so labeled over all their college years, we can begin to find answers to these questions. *taking into consideration non-academic factors that influence academic performance such as race, gender, socio-economic status, and ideological orientation. Through interviews twice a semester over six years, the collection of papers written for all courses, observations of instructional settings, and analysis of required institutional tests of writing, the author has been able to pull together a more complete picture of writing and intellectual development over the college years than has previously been available in any study. Students are seen to acquire the ability to handle more complex reasoning tasks as they find themselves in more challenging intellectual settings and where risk-taking and exploration of new ideas are valued. The integration of students' previous life experiences into their academic studies allows them to analyze, critique, modify, and apply their previously held world views to their new learning. These changes are seen to occur over time with instructional settings and support providing key roles in writing development. Personal factors in students' lives present difficulties that require persistence and dedication to overcome. Never before have the complexities of real individual lives as they affect academic performance been so clearly presented. Contents: Introduction. Studying Writing and Learning from a True Longitudinal Perspective. Developing Metacognitive Awareness of the Relationship Between Writing and Learning. Effect of Complex Social Histories on Academic Performance. Writing Demands in Relation to Composition Instruction. Institutional Testing. Instructional Settings. Case Studies. Implications for Instruction and Research. Appendices: Study Methodology and Questionnaires. Writing Skills Assessment Test Evaluation Scale (WAT). "Sternglass displays a thorough knowledge of other student writing and often presents useful reviews of the scholarship for less well-read readerrs. She also provides useful advice both for instructors and for researchers interested in doing their own longitudinal studies." "The volume leaves one in awe of how much a dedicated faculty can accomplish, dismayed at the circumstances that brought such poorly prepared students to college classrooms, and aware of how much more could have been accomplished during those seven years..."
"Not only has Sternglass made a contribution here to pedagogy and research, but her analysis should also illumine social policy." "...required reading for policy makers who make the overarching decisions about who gets educated and how....Sternglass gives us considerable new knowledge about the development of writing and learning in college..."
"Sternglass's work is a landmark of sorts, as it is the first longitudinal study of writing and learning at a college level that takes into account not only students' academic lives but also their personal lives....Time to Know Them is an important book, and its poignant and sincere presentation of students' academic and non-academic lives is commendable." "...book is clear and significant, and she offers us compelling documentary. This capable, caring, and eloquent practitioner/researcher explicates a concept too often forgotten in the daily 'processing' of students through our classes: students' growing abilities to reason, solve problems, think critically, and express social concern." —Teaching English in the Two-Year College. "At a time when institutions of higher education are closing their doors to students who are labeled underprepared or remedial, when decontextualized forms of assessment are being used to either place students into courses or limit their instruction, and when students' academic potential is undermined by preconceptions about their abilities, Sternglass's impressive study makes clear that such efforts are wrongheaded, that the lives of students (and of those who work with them) will be impoverished if we as teachers and researchers do not take the 'time to know them.'" "...one of the few scholarly discussions of writing pedagogy that tells and documents the full truth about how people learn to write....Sternglass, more than anyone else I have read, gives us the full picture of the effects of writing pedagogies on undergraduate students. She discusses their backgrounds, their development as students, as people, and as respondents to the bureaucracies of writing assessment. The book relates the struggles and achievements of the students to financial situations in the university and in the city and state of New York. Every aspect of writing development--individual, social, political, and psychological--is covered in this book. It should be required reading for graduate students in English, Rhetoric, and Composition faculty members, writing program administrators, and especially, deans and faculty members in non-English departments who think they know what 'the teaching of writing' entails. Sternglass should be congratulated for helping us bring realism to the understanding of writing pedagogy." "...takes the study of student writing into new and ferociously important territory. Through a patient, longitudinal lens, Marilyn Sternglass shows how her students at City College gathered the inner and outer resources to pursue higher education in a system that was working as often against them as with them. Throughout we see the crucial role that writing plays in securing for these students their just inheritance of knowledge, self-illumination, and dignity. This is a rare chronicle of City College twenty years after Shaughnessy. It shows what public higher education really means and why it must be protected."